Tequila is made by steaming the hearts of the blue agave plant, one of approximately 136 species of agave grown in Mexico. Once steamed, the hearts are minced to a pulp, combined with water, and fermented, producing an alcoholic liquid that's then distilled and bottled. Jose Cuervo was a real person. Some tequila distilleries still include an unusual traditional step in the tequila making process--after the agave hearts have been mashed to a pulp, it's transferred into a stone pot, where tequila-makers continue to press it with their hands and feet. 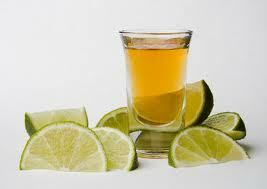 Tequila was used as a flu remedy during Mexico's flu epidemic of 1918. To be classified as tequila, the spirit must contain at least 51% blue agave. These blends are called mixto, though tequila purists insist on 100% blue agave. Scientists can turn tequila vapor into diamonds. It takes blue agave about 8 years to reach maturity sufficient enough to be harvested and distilled into tequila. Last year's International Pizza Expo winner: A pizza made with tequila sauce. The 1918 flu epidemic led to a tequila boom in Mexico as doctors advised ailing patients to drink tequila, lime, and salt as a remedy. With highland and lowland varieties, tequila has its own terroir. Those distilled with agave grown in the highlands north of Guadalajara tend to have a fruitier, floral quality; whereas those from the valleys are earthier, with a little spice. The worm in tequila bottles is just a marketing gimmick. In the Jalisco state of Mexico, home many of the largest tequila distilleries, tequila is often followed by a chaser of sangrita or a "little blood", made of a blend of tomato and orange juice with chili powder. The worm is actually the larvae of a butterfly. Whiskey shortages in the U.S. have often led to increased demand for tequila and its sister spirit mezcal, as was the case during the Civil War, Prohibition, and World War II. Tequila became popular in the U.S. thanks to Prohibition. The world record holder for the largest margarita is Jimmy Buffett's Margaritaville in Orlando, FL. The colossal cocktail held 5,861 gallons of blended booze. In Mexico, tequila is traditionally drunk from a "jicara," the dried shell of the guaya. A diamond-encrusted bottle of Hacienda La Capilla is the most expensive tequila in the world (asking price: $3.5 million).